First Time Mama - First Time Blogger: Followers !! Just a quick update to say I am thrilled I have 15 followers! I feel so special! I hope everyone is enjoying my blog... It's been fun writing and I am trying to keep it somewhat entertaining if I can! 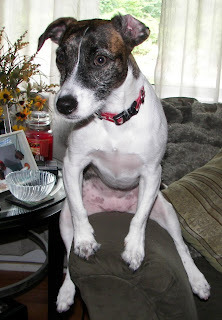 Here is a funny picture of my jack russell terrier mix... She is quite the interesting dog... she likes sitting this way on the sofa chair arm... she's a weird little dog. She is my own little furry follower! p.s. I heard the "House Wren" baby birds chirping this morning! There is nothing cuter than baby birds chirping! I called for my husband like a lunatic to come running so he could hear them, and of course they went silent the minute he got to the window. I don't even want to get near the nest because I don't want to scare the Mama Bird... I hope I am lucky enough to get one photo of them sticking their cute little beaks out of the nest! You should be ok to get a photo, just don't touch anything. Stick the camera near the hole and click away and quietly walk away. Glad to hear you have so many followers. I know people are reading mine, they e-mail me. I have been set up on this blogger site for over a year, (I just never published anything) and I don't remember is it hard to set up as a follower. Most of my friends have hard to care for kids and not a lot of free time. Hopefully, I can finish up the background information tomorrow and start blogging some funny stuff. Keep it up, and you still have a lot of fun heading your way - learning to sit, crawl, walk, talk and all that stuff, should be interesting to read.